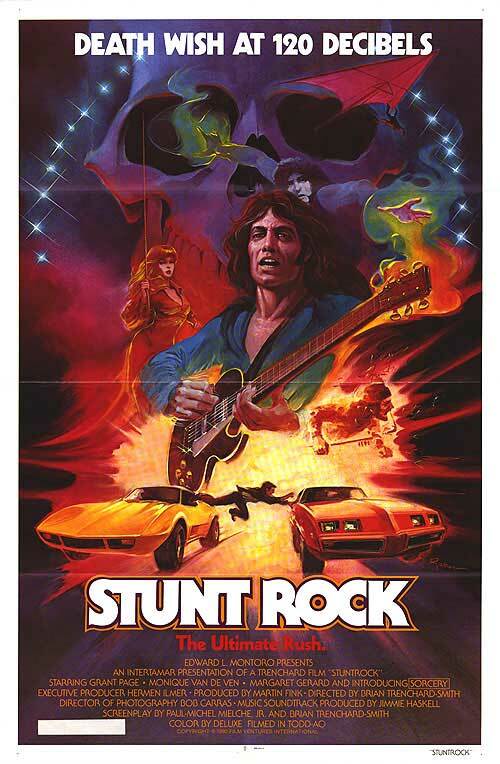 Tag line: "Death Wish At 120 Decibels"
Director Brian Trenchard-Smith has described his 1980 film Stunt Rock as “a professional love letter to stuntmen in general”. The movie is definitely this, but it’s a whole lot more besides. Australian stuntman Grant Page (as himself) travels to America, where he’s been hired to coordinate the stunts for a new television series titled Undercover Girl, starring Dutch actress Monique Van de Ven (as herself). He’s met at the airport by his cousin, Curtis Hyde, aka “Prince of Darkness”, one of five members of a rock band that goes by the name Sorcery. A unique act in that their live shows combine heavy metal with magic tricks, Sorcery also features Paul Haynes (whose on-stage persona is “King of the Wizards”); lead singer Greg Magie; guitarist Smokey Huiff; Richie King on bass; Perry Morris on drums; and Doug Loch (who never takes his mask off) on keyboards. At the motel where he’s staying, Grant meets Lois (Margaret Gerard), a journalist in search of her next story. With Monique usually in tow, Grant and Lois spend their days discussing stunt men, and their nights attending Sorcery concerts. Yet try as she might to understand Grant and those like him, who risk life and limb for the sake of movie or TV show, Lois can’t shake the feeling that the man she’s falling for has some sort of a death wish, and wonders how long it will be before one of his stunts goes very, very wrong. Considered the finest stuntman in Australia at the time, Grant Page pulls off a number of death-defying feats throughout the film, including a leap from a water tower (with blood-filled squibs attached to his chest) and a car crash in which he smashes, head-first, through the windshield while engulfed in flames. Along with the stunt work he performed exclusively for this movie, we’re shown scenes from a few of Page’s earlier films, such as 1976’s Mad Dog Morgan (where another fire-related stunt almost ended in disaster). In addition to the stunts themselves, Stunt Rock teaches us a thing or two about being a stuntman, from the safety measures they take to a general history of the profession, with archive footage of daredevils from the 1920s and a brief look at some of Grant’s peers, including Peter Armstrong, who, in movies like Stone and The Cars That Eat People (both 1974), specialized in jumping from moving vehicles. Occasionally shown in split-screen (thus giving us two views of the action), these sequences are, without a doubt, the film's most entertaining. That’s not to say Sorcery, the rock band that also features prominently in the movie, doesn’t have its moments; their live shows (during which Paul Haynes’ Magician and Curtis Hyde’s Prince of Darkness stage mock battles, trying to outdo each other with flashy magic tricks) are a blast to watch. Aside from the theatrics, Sorcery also performs five original songs, though, to be honest, not a single one impressed me enough to want to seek out more of their music. Sorcery definitely adds some flash and flair to the proceedings, but in this movie, the “rock” takes a backseat to the stunts. Stunt Rock doesn’t fit neatly into any one genre: it’s an action / musical / documentary with touches of fantasy, comedy, and romance tossed into the mix. Yet it’s this very thing that makes it such a fascinating motion picture. 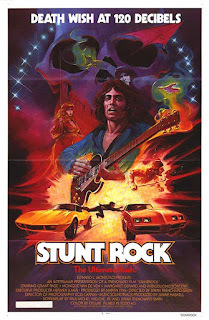 Stunt Rock may be an oddity that’s too strange to classify, but it’s also too much fun to ignore.